This article is about the era of dominance of Western Civilization. For post-1970 growth in inequality, see Great Divergence (inequality). "European miracle" redirects here. For the 1981 book, see The European Miracle. 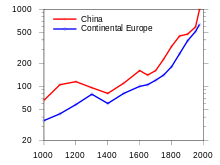 Maddison's estimates of GDP per capita at purchasing power parity in 1990 international dollars for selected European and Asian nations between 1500 and 1950, showing the explosive growth of some European nations from the early 19th century. 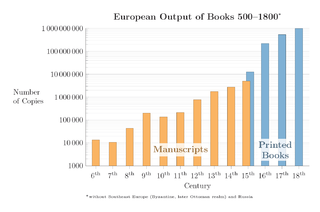 The European book output rose between 500 and 1800 by a factor of 100,000, particularly after the Printing Revolution in 1450. The Great Divergence is a term made popular by Kenneth Pomeranz's book by that title, (also known as the European miracle, a term coined by Eric Jones in 1981) referring to the process by which the Western world (i.e. Western Europe and the parts of the New World where its people became the dominant populations) overcame pre-modern growth constraints and emerged during the 19th century as the most powerful and wealthy world civilization, eclipsing Medieval India, Qing China, the Islamic World, Joseon Korea, and Tokugawa Japan. Scholars have proposed a wide variety of theories to explain why the Great Divergence happened, including geography, culture, institutions, colonialism, resources, and "accidents of history". Scholars also trace back the beginning of the Great Divergence to different periods, with many tracing it back to the Industrial Revolution in 18th-century Britain, while others trace it back to earlier periods of Western history, such as the commercial revolution and the origins of mercantilism and capitalism during the Renaissance and the Age of Discovery, the rise of the European colonial empires, proto-globalization, the Scientific Revolution, or the Age of Enlightenment. The "traditional view", sometimes described as a near-consensus view, is that the Great Divergence occurred before the Industrial Revolution, with Western European states surpassing China, Japan and the Middle East by 1750. However, the "revisionist" view of the "California School" estimates that the divergence started around 1800 during the Industrial Revolution. 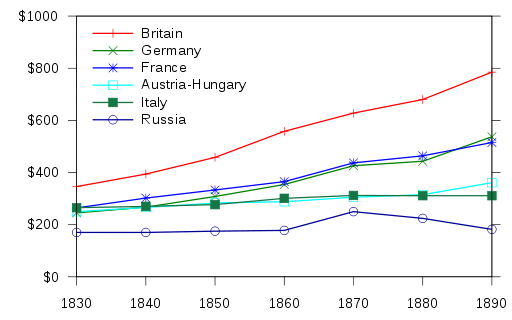 In the twentieth century, the Great Divergence peaked before the First World War and continued until the early 1970s, then, after two decades of indeterminate fluctuations, in the late 1980s it was replaced by the Great Convergence as the majority of Third World countries reached economic growth rates significantly higher than those in most First World countries. Technological advances, in areas such as railroads, steamboats, mining, and agriculture, were embraced to a higher degree in the West than the East during the Great Divergence. Technology led to increased industrialization and economic complexity in the areas of agriculture, trade, fuel and resources, further separating the East and the West. Western Europe's use of coal as an energy substitute for wood in the mid-19th century gave it a major head start in modern energy production. The term "Great Divergence" was coined by Samuel P. Huntington in 1996 and used by Kenneth Pomeranz in his book The Great Divergence: China, Europe, and the Making of the Modern World Economy (2000). The same phenomenon was discussed by Eric Jones, whose 1981 book The European Miracle: Environments, Economies and Geopolitics in the History of Europe and Asia popularized the alternate term "European Miracle". Broadly, both terms signify a socioeconomic shift in which European countries advanced ahead of others during the modern period. The timing of the Great Divergence is in dispute among historians. The traditional dating is as early as the 16th (or even 15th) century, with scholars arguing that Europe had been on a trajectory of higher growth since that date. Pomeranz and others argue that the period of most rapid divergence was during the 19th century. Citing nutrition data and chronic European trade deficits as evidence, these scholars argue that before that date Asia was wealthier and more advanced, especially China in the Yangzi Delta and India, as well as Egypt. Others, while accepting parity of incomes between the most prosperous parts of China, India, Egypt and Europe in the late 18th century, trace the first significant changes in European economies back to the 17th century. Others argue that the cultural factors behind the divergence can be traced to earlier periods and institutions such as the Renaissance and the Chinese imperial examination system. Unlike modern industrial economies, pre-modern economies were constrained by conditions which greatly limited economic growth. Although core regions in Eurasia had achieved a relatively high standard of living by the 18th century, shortages of land, soil degradation, deforestation, lack of dependable energy sources, and other ecological constraints limited growth in per capita incomes. Rapid rates of depreciation on capital meant that a great part of savings in pre-modern economies were spent on replacing depleted capital, hampering capital accumulation. Massive windfalls of fuel, land, food and other resources were necessary for continued growth and capital accumulation, leading to colonialism. The Industrial Revolution overcame these restraints, allowing rapid, sustained growth in per capita incomes for the first time in human history. After the Viking, Muslim and Magyar invasions waned in the 10th century, Europe entered a period of prosperity, population growth and territorial expansion known as the High Middle Ages. Trade and commerce revived, with increased specialization between areas and between the countryside and artisans in towns. By the 13th century the best land had been occupied and agricultural income began to fall, though trade and commerce continued to expand, especially in Venice and other northern Italian cities. The 14th century brought a series of calamities: famines, wars, the Black Death and other epidemics. The resulting drop in the population led to falling rents and rising wages, undermining the feudal and manorial relationships that had characterized Medieval Europe. According to a 2014 study, "there was a ‘little divergence’ within Europe between 1300 and 1800: real wages in the North Sea area more or less stabilized at the level attained after the Black Death, and remained relatively high (above subsistence) throughout the early modern period (and into the nineteenth century); whereas, on the other hand, real wages in the ‘periphery’ (in Germany, Italy, and Spain) began to fall after the fifteenth century and returned to some kind of subsistence minimum during the 1500–1800 period. This ‘little divergence’ in real wages mirrors a similar divergence in GDP per capita: in the ‘periphery’ of Europe there was almost no per capita growth (or even a decline) between 1500 and 1800, whereas in Holland and England real income continued to rise and more or less doubled in this period." The West had a series of unique advantages compared to Asia, such as the proximity of coal mines; the discovery of the New World, which alleviated ecological restraints on economic growth (land shortages etc. ); and the profits from colonization. Comparative populations (millions, log scale) of China and Continental Europe between 1000 and 1975. China had a larger population than Europe throughout the Common Era. Unlike Europe, it was politically united for long periods during that time. During the Song Dynasty (960–1279), the country experienced a revolution in agriculture, water transport, finance, urbanization, science and technology, which made the Chinese economy the most advanced in the world from about 1100. Mastery of wet-field rice cultivation opened up the hitherto underdeveloped south of the country, while later northern China was devastated by Jurchen and Mongol invasions, floods and epidemics. The result was a dramatic shift in the center of population and industry from the home of Chinese civilization around the Yellow River to the south of the country, a trend only partially reversed by the re-population of the north from the 15th century. By 1300, China had fallen behind Italy in living standards. In the late imperial period (1368–1911), comprising the Ming and Qing dynasties, taxation was low, and the economy and population grew significantly, though without substantial increases in productivity. Chinese goods such as silk, tea and ceramics were in great demand in Europe, leading to an inflow of silver, expanding the money supply and facilitating the growth of competitive and stable markets. By the end of the 18th century, population density levels exceeded those in Europe. China had more large cities but far fewer small ones than in contemporary Europe. The traditional view is that the Great Divergence between China and Europe had begun by 1750, before the Industrial Revolution. Revisionist scholarship, however, estimates that the Great Divergence did not begin until the 19th century, during the Industrial Revolution. 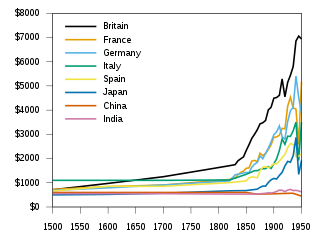 The global contribution to world's GDP by major economies from 1 CE to 2003 CE according to Angus Maddison's estimates. Up until the 18th century, China and India were the two largest economies by GDP output. By the 1500s, India benefited from extensive external and internal trade. Its agriculture was highly efficient as well as its industry. Unlike China, Japan and western and central Europe, India did not experience extensive deforestation until the 19th and 20th centuries. It thus had no pressure to move to coal as a source of energy. From the 17th century, cotton textiles from Mughal India became popular in Europe, with some governments banning them to protect their wool industries. In the 18th century, India was the most important manufacturer in world trade, producing about 25% of the world's industrial output in 1750. According to economic historian Indrajit Ray, Mughal Bengal in particular was globally prominent in industries such as textile manufacturing and shipbuilding. In early modern Europe, there was significant demand for products from Mughal India, particularly cotton textiles, as well as goods such as spices, peppers, indigo, silks, and saltpeter (for use in munitions). European fashion, for example, became increasingly dependent on Indian textiles and silks. In the 17th and 18th centuries, India accounted for 95% of British imports from Asia, and the Bengal Subah alone accounted for 40% of Dutch imports from Asia. Amiya Kumar Bagchi estimates 10.3% of Bihar's populace were involved in hand spinning thread, 2.3% weaving, and 9% in other manufacturing trades, in 1809-13, to satisfy this demand. In contrast, there was very little demand for European goods in India, which was largely self-sufficient, thus Europeans had very little to offer, except for some woolen textiles, unprocessed metals and a few luxury items. The trade imbalance caused Europeans to export large quantities of gold and silver to India in order to pay for Indian imports. The Middle East was more advanced than Western Europe in 1000 CE, on par by the middle of the 16th century, but by 1750, leading Middle-Eastern states had fallen behind the leading Western European states of Britain and the Netherlands. An example of a Middle-Eastern country that had an advanced economy in the early 19th century was Ottoman Egypt, which had a highly productive industrial manufacturing sector, and per-capita income that was comparable to leading Western European countries such as France and higher than that of Japan and Eastern Europe. Other parts of the Ottoman Empire, particularly Syria and southeastern Anatolia, also had a highly productive manufacturing sector that was evolving in the 19th century. In 1819, Egypt under Muhammad Ali began programs of state-sponsored industrialization, which included setting up factories for weapons production, an iron foundry, large-scale cotton cultivation, mills for ginning, spinning and weaving of cotton, and enterprises for agricultural processing. By the early 1830s, Egypt had 30 cotton mills, employing about 30,000 workers. In the early 19th century, Egypt had the world's fifth most productive cotton industry, in terms of the number of spindles per capita. The industry was initially driven by machinery that relied on traditional energy sources, such as animal power, water wheels, and windmills, which were also the principle energy sources in Western Europe up until around 1870. 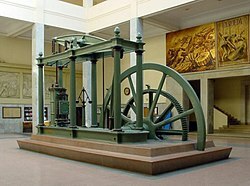 While steam power had been experimented with in Ottoman Egypt by engineer Taqi ad-Din Muhammad ibn Ma'ruf in 1551, when he invented a steam jack driven by a rudimentary steam turbine, it was under Muhammad Ali of Egypt in the early 19th century that steam engines were introduced to Egyptian industrial manufacturing. Boilers were manufactured and installed in Egyptian industries such as ironworks, textile manufacturing, paper mills, and hulling mills. Compared to Western Europe, Egypt also had superior agriculture and an efficient transport network through the Nile. Economic historian Jean Batou argues that the necessary economic conditions for rapid industrialization existed in Egypt during the 1820s–1830s. Japanese society was governed by the Tokugawa Shogunate, which divided Japanese society into a strict hierarchy and intervened considerably in the economy through state monopolies and restrictions on foreign trade; however, in practice, the Shogunate's rule was often circumvented. From 725-1974, Japan experienced GDP per capita growth at an annual rate of 0.04%, with major periods of positive per capita GDP growth occurring during 1150-1280, 1450-1600 and after 1730. There were no significant periods of sustained growth reversals. Relative to the United Kingdom, GDP per capita was at roughly similar levels until the middle of the 17th century. By 1850, per capita incomes in Japan were approximately a quarter of the British level. However, 18th-century Japan had a higher life expectancy, 41.1 years for adult males,[not in citation given] compared with 31.6 to 34 for England, between 27.5 and 30 for France, and 24.7 for Prussia. In its earlier days, Korea had healthy international trading relationships, receiving merchants from as far as the Middle East. Because of its strategic value to its neighboring countries, however, Korea had been invaded several times during its Goryeo and Joseon eras, starting with the Mongol invasion in the 13th century. Though repelled due to its strong navy and aid from China, the Japanese invasions in the late 16th century were particularly devastating to the peninsula and it never truly recovered until the modern era. Due to relatively frequent invasions, increased Western colonization of Asia, and the arrival of Christian missionaries, Korea began a long period of isolationism, maintaining diplomatic relationships primarily with China only. For the rest of the Joseon period, the country was marred by economic hardships, peasant revolts, and political factionalism until it was annexed by Japan in the early 20th century. Pre-colonial Sub-Saharan Africa was politically fragmented, just as early modern Europe was. Africa was however far more sparsely populated than Europe. According to University of Michigan political scientist Mark Dincecco, "the high land/ labor ratio may have made it less likely that historical institutional centralization at the “national level” would occur in sub-Saharan Africa, thwarting further state development." The transatlantic slave trade may have further weakened state power in Africa. Scholars have proposed numerous theories to explain why the Great Divergence occurred. 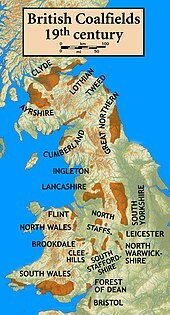 The distribution of coal deposits shaped industrial development in Britain. In metallurgy and steam engines the Industrial Revolution made extensive use of coal and coke - as cheaper, more plentiful and more efficient than wood and charcoal. Coal-fired steam engines also operated in the railways and in shipping, revolutionizing transport in the early 19th century. Kenneth Pomeranz drew attention to differences in the availability of coal between West and East. Due to regional climate, European coal mines were wetter, and deep mines did not become practical until the introduction of the Newcomen steam engine to pump out groundwater. In mines in the arid northwest of China, ventilation to prevent explosions was much more difficult. Another difference involved geographic distance; although China and Europe had comparable mining technologies, the distances between the economically developed regions and coal deposits differed vastly. The largest coal deposits in China are located in the northwest, within reach of the Chinese industrial core during the Northern Song (960-1127). During the 11th century China developed sophisticated technologies to extract and use coal for energy, leading to soaring iron production. The southward population shift between the 12th and 14th centuries resulted in new centers of Chinese industry far from the major coal deposits. Some small coal deposits were available locally, though their use was sometimes hampered by government regulations. In contrast, Britain contained some of the largest coal deposits in Europe - all within a relatively compact island. Ottoman Egypt, which used steam power for industrial manufacturing under Muhammad Ali Pasha (ruled 1805-1848), had a lack of coal resources. However, Muhammad Ali Pasha's prospectors searched for coal deposits, and boilers were manufactured and installed in various industries. Egypt also imported coal from overseas, at similar prices to what imported coal cost in France, until the 1830s, when Cairo gained access to coal sources in Lebanon, which had a yearly coal output of 4,000 tons. Economic historian Jean Batou argues that, in addition to having the necessary conditions for rapid industrialization, Egypt also had the necessary conditions for the adoption of oil as a potential energy source for its steam engines later in the 19th century. A common argument is that Europe had more free and efficient markets than other civilizations, which has been cited as a reason for the Great Divergence. In Europe, market efficiency was disrupted by the prevalence of feudalism and mercantilism. Practices such as entail, which restricted land ownership, hampered the free flow of labor and buying and selling of land. These feudal restrictions on land ownership were especially strong in continental Europe. China had a relatively more liberal land market, hampered only by weak customary traditions. Bound labor, such as serfdom and slavery were more prevalent in Europe than in China, even during the Manchu conquest. Urban industry in the West was more restrained by guilds and state-enforced monopolies than in China, where in the 18th century the principal monopolies governed salt and foreign trade through Guangzhou. Pomeranz rejects the view that market institutions were the cause of the Great Divergence, and concludes that China was closer to the ideal of a market economy than Europe. In his book Guns, Germs, and Steel, Jared Diamond argues for the importance of geography. He claims that advanced cultures outside Europe had developed in areas whose geography was conducive to large, monolithic, isolated empires. In these conditions policies of technological and social stagnation could persist. He gives the example of China in 1432, when the new[clarification needed] Xuande Emperor outlawed the building of ocean-going ships, in which China was the world leader at the time. On the other hand, Europe's geography favored balkanization into smaller, closer, nation-states, as its many natural barriers (mountains, rivers) provide defensible borders. As a result, governments that suppressed economic and technological progress soon corrected their mistakes or were out-competed relatively quickly. He argues that these factors created the conditions for more rapid internal superpower change (Spain succeeded by France and then by the United Kingdom) than was possible elsewhere in Eurasia. Testing theories related to geographic endowments economists William Easterly and Ross Levine find evidence that tropics, germs, and crops affect development through institutions. They find no evidence that tropics, germs, and crops affect country incomes directly other than through institutions, nor did they find any effect of policies on development once controls for institutions were implemented. Beginning in the early 19th century, economic prosperity rose greatly in the West due to improvements in technological efficiency, as evidenced by the advent of new conveniences including the railroad, steamboat, steam engine, and the use of coal as a fuel source. These innovations contributed to the Great Divergence, elevating Europe and the United States to high economic standing relative to the East. It has been argued the attitude of the East towards innovation is one of the other factors that might have played a big role in the West's advancements over the East. According to David Landes, after a few centuries of innovations and inventions, it seemed like the East stopped trying to innovate and began to sustain what they had. They kept nurturing their pre-modern inventions and did not move forward with the modern times. China decided to continue a self-sustaining process of scientific and technological advancement on the basis of their indigenous traditions and achievements. The East’s attitude towards innovation showed that they focused more on experience, while the West focused on experimentation. The East did not see the need to improve on their inventions and thus from experience, focused on their past successes. While they did this, the West was focused more on experimentation and trial by error, which led them to come up with new and different ways to improve on existing innovations and create new ones. In the early 19th century, Egypt under Muhammad Ali began a program of state-sponsored industrialization, quick to adopt steam engine technology, and manufacturing boilers for installation in a number of industries, including ironworks, textile manufacturing, paper mills, and hulling mills. While there was a lack of coal deposits in Egypt, Muhammad Ali Pasha's prospectors searched for coal deposits in Egypt while importing coal from overseas at similar prices to what imported coal cost in France, until the 1830s when Egypt gained access to coal sources in Lebanon with its yearly coal output of 4,000 tons. Economic historian Jean Batou argues that Egypt had the necessary economic conditions for rapid industrialization in the early 19th century, and for the adoption of oil as a potential energy source for its steam engines later in the 19th century. Classical economists, beginning with Adam Smith and Thomas Malthus, argued that high wages in the West stimulated labor-saving technological advancements. Revisionist studies in the mid to late 20th century have depicted living standards in 18th century China and pre-Industrial Revolution Europe as comparable. Life expectancy in China and Japan for adult males were 39.6 and 41.1 respectively, compared with 34 for England, between 27.5 and 30 for France, and 24.7 for Prussia. Chinese laborers in the Yangtze delta consumed 4,600 calories per day on average (laborers in China overall consumed 2,637 calories on average) compared with 2,000-2,500 calories per day for England. According to Pomeranz and others, there was modest per capita growth in both regions, the Chinese economy was not stagnant, and in many areas, especially agriculture, was ahead of Western Europe. Chinese cities were also ahead in public health. Economic historian Paul Bairoch estimated that China's GNP per capita in 1800 was $228 in 1960 US dollars ($1,007 in 1990 dollars), higher than Western Europe's $213 ($941 in 1990 dollars) at the time. There have been similar findings for India. Real wages and living standards in 18th-century Bengal and Mysore were higher than in Britain, which in turn had the highest living standards in Europe. Workers in the textile industry, for example, earned more in Bengal and Mysore than they did in Britain, while agricultural labour in Britain had to work longer hours to earn the same amount as in Mysore. In the late 18th century, Mysore's average per-capita income was five times higher than subsistence level, i.e. five times higher than $400 (1990 international dollars), or $2,000 per capita. In comparison, the highest national per-capita incomes in 1820 were $1,838 for the Netherlands and $1,706 for Britain. Similarly for Ottoman Egypt, its per-capita income in 1800 was comparable to that of leading Western European countries such as France, and higher than the overall average income of Europe and Japan. Economic historian Jean Barou estimated that, in terms of 1960 dollars, Egypt in 1800 had a per-capita income of $232 ($1,025 in 1990 dollars). In comparison, per-capita income in terms of 1960 dollars for France in 1800 was $240 ($1,060 in 1990 dollars), for Eastern Europe in 1800 was $177 ($782 in 1990 dollars), and for Japan in 1800 was $180 ($795 in 1990 dollars). According to Paul Bairoch, in the mid-18th century, "the average standard of living in Europe was a little bit lower than that of the rest of the world." He estimated that, in 1750, the average GNP per capita in the Eastern world (particularly China, India and the Middle East) was $188 in 1960 dollars ($830 in 1990 dollars), higher than the West's $182 ($804 in 1990 dollars). He argues that it was after 1800 that Western European per-capita income pulled ahead. However, the average incomes of China and Egypt were still higher than the overall average income of Europe. However, responding to the work of Bairoch, Pomeranz, Parthasarathi and others more subsequent research have found that parts of 18th century Western Europe did have higher wages and levels of per capita income than in much of India, Ottoman Turkey, Japan and China. However, the views of Adam Smith were found to have overgeneralized Chinese poverty. Between 1725 and 1825 laborers in Beijing and Delhi were only able to purchase a basket of goods at a subsistence level, while laborers in London and Amsterdam were able to purchase goods at between 4 and 6 times a subsistence level. As early as 1600 Indian GDP per capita was about 60% the British level. A real decline in per capita income did occur in both China and India but in India began during the Mughal period before British colonialism. Outside of Europe much of this decline and stagnation has been attributed to population growth in rural areas outstripping growth in cultivated land as well as internal political turmoil. Free colonials in British North America were considered by historians and economists in a survey of academics to be amongst the most well off people in the world on the eve of the American Revolution. The earliest evidence of a major health transition leading to increased life expectancy began in Europe in the 1770's, approximately one century before Asia's. A number of economic historians have argued that European colonialism played a major role in the deindustrialization of non-Western societies. Paul Bairoch, for example, cites British colonialism in India as a primary example, but also argues that European colonialism played a major role in the deindustrialization of other countries in Asia, the Middle East, and Latin America, and contributed to a sharp economic decline in Africa. Other modern economic historians have blamed British colonial rule for India's deindustrialization in particular. The colonization of India is seen as a major factor behind both India's deindustrialization and Britain's Industrial Revolution. Up until the 19th century, India was the world's leading cotton textile manufacturer, with Bengal and Mysore the centers of cotton production. In order to compete with India, Britain invested in labour-saving technical progress for textile manufacture during the Industrial Revolution, while implementing protectionist policies such as bans and tariffs to restrict Indian imports. At the same time, the British East India Company's rule in India contributed to its deindustrialization, with the decline of native industry opening up a new market for British goods. British colonization forced open the large Indian market to British goods while restricting Indian imports to Britain, and raw cotton was imported from India without taxes or tariffs to British factories which manufactured textiles from Indian cotton and sold them back to the Indian market. India thus served as both an important supplier of raw goods such as cotton to British factories and a large captive market for British manufactured goods. In addition, the capital amassed from Bengal following its conquest after the Battle of Plassey in 1757 was used to invest in British industries such as textile manufacturing and greatly increase British wealth. Britain eventually surpassed India as the world's leading cotton textile manufacturer in the 19th century. British colonial rule has been blamed for the subsequently dismal state of British India's economy, with investment in Indian industries limited since it was a colony. Economic decline in India has been traced to before British colonial rule and was largely a result of increased output in other parts of the world and Mughal disintegration. India's share of world output(24.9%) was largely a function of its share of the world population around 1600. Between 1880 and 1930 total Indian cotton textile production increased from 1200 million yards to 3700 million yards. The introduction of railways into India have been a source of controversy regarding their overall impact, but evidence points to a number of positive outcomes such as higher incomes, economic integration, and famine relief. Per capita GDP decreased from $550(in 1990 dollars) per person in 1700 under Mughal rule to $533 (in 1990 dollars) in 1820 under British rule, then increased to 618$(in 1990 dollars) in 1947 upon independence. Coal production increased in Bengal, largely to satisfy the demand of the railroads. Life expectancy increased by about 10 years between 1870 and independence. Recent research on colonialism has been more favorable regarding its long term impacts on growth and development. A 2001 paper by Daren Acemoglu, Simon Johnson, and James Robinson found that nations with temperate climates and low levels of mortality were more popular with settlers and were subjected to greater degrees of colonial rule. Those nations benefited from Europeans creating more inclusive institutions that lead to higher rates of long term growth. Subsequent research has confirmed that both how long a nation was a colony or how many Europeans settlers migrated there are positively correlated with economic development and institutional quality, although the relationships becomes stronger after 1700 and vary depending on the colonial power, with British colonies typically fairing best. Luxury consumption is regarded by many scholars to have stimulated the development of capitalism and thus contributed to the Great Divergence. Proponents of this view argue that workshops, which manufactured luxury articles for the wealthy, gradually amassed capital to expand their production and then emerged as large firms producing for a mass market; they believe that Western Europe's unique tastes for luxury stimulated this development further than other cultures. However, others counter that luxury workshops were not unique to Europe; large cities in China and Japan also possessed many luxury workshops for the wealthy, and that luxury workshops do not necessarily stimulate the development of "capitalistic firms". Differences in property rights have been cited as a possible cause of the Great Divergence. This view states that Asian merchants could not develop and accumulate capital because of the risk of state expropriation and claims from fellow kinsmen, which made property rights very insecure compared to those of Europe. However, others counter that many European merchants were de facto expropriated through defaults on government debt, and that the threat of expropriation by Asian states was not much greater than in Europe, except in Japan. Government and policies are seen as an integral part of modern societies and have played a major role in how different economies have been formed. The Eastern societies had governments which were controlled by the ruling dynasties and thus, were not a separate entity. Their governments at the time lacked policies that fostered innovation and thus resulted in slow advancements. As explained by Cohen, the east had a restrictive system of trade that went against the free world market theory; there was no political liberty or policies that encouraged the capitalist market (Cohen, 1993). This was in contrast to the western society that developed commercial laws and property rights which allowed for the protection and liberty of the marketplace. Their capitalist ideals and market structures encouraged innovation. However, Robert Brenner and Chris Isett emphasize differences in land tenancy rights. They argue that in the lower Yangtze, most farmers either owned land or held secure tenancy at fixed rates of rent, so that neither farmers nor landlords were exposed to competition. In 15th century England, lords had lost their serfs, but were able to assert control over almost all of the land, creating a rental market for tenant farmers. This created competitive pressures against subdividing plots, and the fact that plots could not be directly passed on to sons forced them to delay marriage until they had accumulated their own possessions. Thus in England both agricultural productivity and population growth were subject to market pressures throughout the early modern period. A 2017 study found that secure property rights in Europe, but not in large parts of the Middle-East, contributed to the increase of expensive labour-saving capital goods, such as water-mills, windmills, and cranes, in medieval Europe but its decrease in the Middle-East. A variety of theories posit Europe's unique relationship with the New World as a major cause of the Great Divergence. The high profits earned from the colonies and the slave trade constituted 7 percent a year, a relatively high rate of return considering the high rate of depreciation on pre-industrial capital stocks, which limited the amount of savings and capital accumulation. Early European colonization was sustained by profits through selling New World goods to Asia, especially silver to China. According to Pomeranz, the most important advantage for Europe was the vast amount of fertile, uncultivated land in the Americas which could be used to grow large quantities of farm products required to sustain European economic growth and allowed labor and land to be freed up in Europe for industrialization. New World exports of wood, cotton, and wool are estimated to have saved England the need for 23 to 25 million acres (100,000 km2) of cultivated land (by comparison, the total amount of cultivated land in England was just 17 million acres), freeing up immense amounts of resources. The New World also served as a market for European manufactures. Chen (2012) also suggested that the New World as a necessary factor for industrialization, and trade as a supporting factor causing less developed areas to concentrate on agriculture supporting industrialized regions in Europe. The high-level equilibrium trap theory argues that China did not undergo an indigenous industrial revolution since its economy was in a stable equilibrium, where supply and demand for labor were equal, disincentivizing the development of labor-saving capital. Rosenberg and Birdzell claims that the so-called "eastern culture" of "respect" and "unquestionable devotion" to the ruling dynasty was as a result of a culture where the control of the dynasty led to a "silent society" that "did not ask questions or experiment without the approval or order from the ruling class". On the other hand, they claimed that the West of the late medieval era did not have a central authority or absolute state, which allowed for a free flow of ideas (Rosenberg, Birdzell, 1986). This so-called "eastern culture" also supposedly showed a "dismissal of change" due to their "fear of failure" and disregard for the imitation of outside inventions and science; this was different from the "western culture" which they claimed to be willing to experiment and imitate others to benefit their society. They claimed that this was a culture where change was encouraged, and sense of anxiety and disregard for comfort led them to be more innovative. Max Weber argued in The Protestant Ethic and the Spirit of Capitalism that capitalism in northern Europe evolved when the Protestant work ethic (particularly Calvinist) influenced large numbers of people to engage in work in the secular world, developing their own enterprises and engaging in trade and the accumulation of wealth for investment. In his book The Religion of China: Confucianism and Taoism he blames Chinese culture for the non-emergence of capitalism in China. Chen (2012) similarly claims that cultural differences were the most fundamental cause for the divergence, arguing that the Humanism of the Renaissance followed by the Enlightenment (including revolutionary changes in attitude towards religion) enabled a mercantile, innovative, individualistic, and capitalistic spirit. For Ming Dynasty China, he claims there existed repressive measures which stifled dissenting opinions and nonconformity. He claimed that Confucianism taught that disobedience to one's superiors was supposedly tantamount to "sin". In addition Chen claimed that merchants and artificers had less prestige than they did in Western Europe. Justin Yifu Lin has argued for the role of the imperial examination system in removing the incentives for Chinese intellectuals to learn mathematics or to conduct experimentation. However, many scholars who have studied Confucian teachings have criticized the claim that the philosophy promoted unquestionable loyalty to one's superiors and the state. The core of Confucian philosophy itself was already Humanistic and Rationalistic; it "[does] not share a belief in divine law and [does] not exalt faithfulness to a higher law as a manifestation of divine will." One of the central teachings of Confucianism is that one should remonstrate with authority. Many Confucians throughout history disputed their superiors in order to not only prevent the superiors and the rulers from wrongdoing, but also to maintain the independent spirits of the Confucians. Furthermore, the merchant class of China throughout all of Chinese history were usually wealthy and held considerable influence above their supposed social standing. Historians like Yu Yingshi and Billy So have shown that as Chinese society became increasingly commercialized from the Song dynasty onward, Confucianism had gradually begun to accept and even support business and trade as legitimate and viable professions, as long as merchants stayed away from unethical actions. Merchants in the meantime had also benefited from and utilized Confucian ethics in their business practices. By the Song period, the Scholar-officials themselves were using intermediary agents to participate in trading. This is true especially in the Ming-Qing dynasties, when the social status of merchants had risen to such significance that by the late Ming period, many scholar-officials were unabashed to declare publicly in their official family histories that they had family members who were merchants. Consequently, while Confucianism did not actively promote profit seeking, it did not hinder China’s commercial development either. Of the developed cores of the Old world, India was distinguished by its caste system of bound labor, which hampered economic and population growth and resulted in relative underdevelopment compared to other core regions. Compared with other developed regions, India still possessed large amounts of unused resources. India's caste system gave an incentive to elites to drive their unfree laborers harder when faced with increased demand, rather than invest in new capital projects and technology. The Indian economy was characterized by vassal-lord relationships, which weakened the motive of financial profit and the development of markets; a talented artisan or merchant could not hope to gain much personal reward. Pomeranz argues that India was not a very likely site for an industrial breakthrough, despite its sophisticated commerce and technologies. Aspects of Islamic law have been proposed as an argument for the divergence for the Muslim world. Economist Timur Kuran argues that Islamic institutions which had at earlier stages promoted development later started preventing more advanced development by hampering formation of corporations, capital accumulation, mass production, and impersonal transactions. Other similar arguments proposed include the gradual prohibition of independent religious judgements (Ijtihad) and a strong communalism which limited contacts with outside groups and the development of institutions dealing with more temporary interactions of various kinds, according to Kuran. According to historian Donald Quataert, however, the Ottoman Middle East's manufacturing sector was highly productive and evolving in the 19th century. Quataert criticizes arguments rooted in Orientalism, such as "now-discredited stereotypes concerning the inferiority of Islam", economic institutions having stopped evolving after the Islamic Golden Age, and decline of Ijtihad in religion negatively affecting economic evolution. Economic historian Paul Bairoch noted that Ottoman law promoted liberal free trade earlier than Britain and the United States, arguing that free trade had a negative economic impact on the Ottoman Empire and contributed to its deindustrialization, in contrast to the more protectionist policies of Britain and the United States in the early 19th century. Economic historian Joel Mokyr has argued that political fragmentation (the presence of a large number of European states) made it possible for heterodox ideas to thrive, as entrepreneurs, innovators, ideologues and heretics could easily flee to a neighboring state in the event that the one state would try to suppress their ideas and activities. This is what set Europe apart from the technologically advanced, large unitary empires such as China. China had both a printing press and movable type, yet the industrial revolution would occur in Europe. In Europe, political fragmentation was coupled with an "integrated market for ideas" where Europe's intellectuals used the lingua franca of Latin, had a shared intellectual basis in Europe's classical heritage and the pan-European institution of the Republic of Letters. The vast size of the Chinese empire created a severe principal-agent problem and constrained how the country was governed. In particular, taxes had to be kept low due to the emperor's weak oversight of his agents and the need to keep corruption in check. The Chinese state's fiscal weaknesses were long masked by its huge tax base. However, economic and demographic expansion in the eighteenth century exacerbated the problems of administrative control. This put a further squeeze on the nation's finances and left China ill-prepared for the challenges of the nineteenth century. One reason why Japan was able to modernize and adopt the technologies of the West was due to its much smaller size relative to China. The historian Jeffrey G. Williamson has argued that India went through a period of deindustrialization in the latter half of the 18th century as an indirect outcome of the collapse of the Mughal Empire, with British rule later causing further deindustrialization. According to Williamson, the decline of the Mughal Empire led to a decline in agricultural productivity, which drove up food prices, then nominal wages, and then textile prices, which led to India losing a share of the world textile market to Britain even before it had superior factory technology, though Indian textiles still maintained a competitive advantage over British textiles up until the 19th century. Economic historian Prasannan Parthasarathi, however, has argued that there wasn't any such economic decline for several post-Mughal states, notably Bengal Subah and the Kingdom of Mysore, which were comparable to Britain in the late 18th century, until British colonial policies caused deindustrialization. that Europe's political fragmentation interacted with her institutional innovations to foster substantial areas of “economic liberty,” where European merchants could organize production freer of central regulation, faced fewer central restrictions on their shipping and pricing decisions, and paid lower tariffs and tolls than their counterparts elsewhere in Eurasia. When fragmentation afforded merchants multiple politically independent routes on which to ship their goods, European rulers refrained from imposing onerous regulations and levying arbitrary tolls, lest they lose mercantile traffic to competing realms. Fragmented control of trade routes magnified the spillover effects of political reforms. If parliament curbed arbitrary regulations and tolls in one realm, then neighboring rulers might have to respond in kind, even if they themselves remained without a parliament. Greater economic liberty, fostered by the interaction of fragmentation and reform, unleashed faster and more inter-connected urban growth. Justin Yifu Lin argued that China's large population size proved beneficial in technological advancements prior to the 14th century, but that the large population size was not an important factor in the kind of technological advancements that resulted in the Industrial Revolution. Early technological advancements depended on "learning by doing" (where population size was an important factor, as advances could spread over a large political unit), whereas the Industrial Revolution was the result of experimentation and theory (where population size is less important). A number of economists have argued that representative government was a factor in the Great Divergence. The argue that absolutist governments, where rulers are not broadly accountable, are bad for property rights and innovation, and that they are prone to corruption and rent-seeking. Representative governments however were accountable to broader segments of the population and thus had to protect property rights and not rule in arbitrary ways, which caused economic prosperity. A 2017 study in the American Economic Review found that "globalization was the major driver of the economic divergence between the rich and the poor portions of the world in the years 1850-1900." The states that benefited from globalization were "characterised by strong constraints on executive power, a distinct feature of the institutional environment that has been demonstrated to favour private investment." A number of economic historians have posited that the Industrial Revolution may have partly occurred where and when it did due to luck and chance. The Old World methods of agriculture and production could only sustain certain lifestyles. Industrialization dramatically changed the European economy and allowed it to attain much higher levels of wealth and productivity than the other Old World cores. Although Western technology later spread to the East, differences in uses preserved the Western lead and accelerated the Great Divergence. When analyzing comparative use-efficiency, the economic concept of total factor productivity (TFP) is applied to quantify differences between countries. TFP analysis controls for differences in energy and raw material inputs across countries and is then used to calculate productivity. The difference in productivity levels, therefore, reflects efficiency of energy and raw materials use rather than the raw materials themselves. TFP analysis has shown that Western countries had higher TFP levels on average in the 19th century than Eastern countries such as India or China, showing that Western productivity had surpassed the East. Some of the most striking evidence for the Great Divergence comes from data on per capita income. The West's rise to power directly coincides with per capita income in the West surpassing that in the East. This change can be attributed largely to the mass transit technologies, such as railroads and steamboats, that the West developed in the 19th century. The construction of large ships, trains, and railroads greatly increased productivity. These modes of transport made moving large quantities of coal, corn, grain, livestock and other goods across countries more efficient, greatly reducing transportation costs. These differences allowed Western productivity to exceed that of other regions. Economic historian Paul Bairoch has estimated the GDP per capita of several major countries in 1960 US dollars after the Industrial Revolution in the early 19th century, as shown below. His estimates show that the GDP per capita of Western European countries rose rapidly after industrialization. For the 18th century, and in comparison to non-European regions, Bairoch in 1995 stated that, in the mid-18th century, "the average standard of living in Europe was a little bit lower than that of the rest of the world." Before and during the early 19th century, much of continental European agriculture was underdeveloped compared to Asian Cores and England. This left Europe with abundant idle natural resources. England, on the other hand, had reached the limit of its agricultural productivity well before the beginning of the 19th century. Rather than taking the costly route of improving soil fertility, the English increased labor productivity by industrializing agriculture. From 1750 to 1850, European nations experienced population booms; however, European agriculture was barely able to keep pace with the dietary needs. Imports from the Americas, and the reduced caloric intake required by industrial workers compared to farmers allowed England to cope with the food shortages. By the turn of the 19th century, much European farmland had been eroded and depleted of nutrients. Fortunately, through improved farming techniques, the import of fertilizers, and reforestation, Europeans were able to recondition their soil and prevent food shortages from hampering industrialization. Meanwhile, many other formerly hegemonic areas of the world were struggling to feed themselves – notably China. The global demand for wood, a major resource required for industrial growth and development, was increasing in the first half of the 19th century. A lack of interest of silviculture in Western Europe, and a lack of forested land, caused wood shortages. By the mid-19th century, forests accounted for less than 15% of land use in most Western European countries. Fuel costs rose sharply in these countries throughout the 18th century and many households and factories were forced to ration their usage, and eventually adopt forest conservation policies. It was not until the 19th century that coal began providing much needed relief to the European energy shortage. China had not begun to use coal on a large scale until around 1900, giving Europe a huge lead on modern energy production. Through the 19th century, Europe had vast amounts of unused arable land with adequate water sources. However, this was not the case in China; most idle lands suffered from a lack of water supply, so forests had to be cultivated. Since the mid-19th century, northern China's water supplies have been declining, reducing its agricultural output. By growing cotton for textiles, rather than importing, China exacerbated its water shortage. During the 19th century, supplies of wood and land decreased considerably, greatly slowing growth of Chinese per capita incomes. 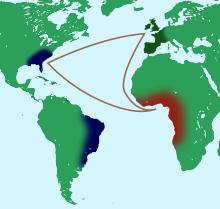 18th century triangular trade between Europe, the New World, and Africa. During the era of European imperialism, periphery countries were often set up as specialized producers of specific resources. Although these specializations brought the periphery countries temporary economic benefit, the overall effect inhibited the industrial development of periphery territories. Cheaper resources for core countries through trade deals with specialized periphery countries allowed the core countries to advance at a much greater pace, both economically and industrially, than the rest of the world. Europe's access to a larger quantity of raw materials and a larger market to sell its manufactured goods gave it a distinct advantage through the 19th century. In order to further industrialize, it was imperative for the developing core areas to acquire resources from less densely populated areas, since they lacked the lands required to supply these resources themselves. Europe was able to trade manufactured goods to their colonies, including the Americas, for raw materials. The same sort of trading could be seen throughout regions in China and Asia, but colonization brought a distinct advantage to the West. As these sources of raw materials began to proto-industrialize, they would turn to import substitution, depriving the hegemonic nations of a market for their manufactured goods. Since European nations had control over their colonies, they were able to prevent this from happening. Britain was able to use import substitution to its benefit when dealing with textiles from India. Through industrialization, Britain was able to increase cotton productivity enough to make it lucrative for domestic production, and overtake India as the world's leading cotton supplier. Although Britain had limited cotton imports to protect its own industries, they allowed cheap British products into colonial India from the early 19th century. The colonial administration failed to promote Indian industry, preferring to export raw materials. Western Europe was also able to establish profitable trade with Eastern Europe. Countries such as Prussia, Bohemia and Poland had very little freedom in comparison to the West;[vague] forced labor left much of Eastern Europe with little time to work towards proto-industrialization and ample manpower to generate raw materials. A 2017 study in the Quarterly Journal of Economics argued, "medieval European institutions such as guilds, and specific features such as journeymanship, can explain the rise of Europe relative to regions that relied on the transmission of knowledge within closed kinship systems (extended families or clans)". Guilds and journeymanship were superior for creating and disseminating knowledge, which contributed to the occurrence of the Industrial Revolution in Europe. ^ a b Jones 2003. ^ a b c d "Global Economic History: A Very Short Introduction | Robert C. Allen | 9780199596652 | Oxford University Press Canada". www.oupcanada.com. 2011. Retrieved 2018-02-20. Why has the world become increasingly unequal? Both ‘fundamentals’ like geography, institutions, or culture and ‘accidents of history’ played a role. ^ pseudoerasmus (2014-06-12). "The Little Divergence". pseudoerasmus. Retrieved 2017-08-19. ^ "Business History, the Great Divergence and the Great Convergence". HBS Working Knowledge. 2017-08-01. Retrieved 2017-08-19. ^ Vries, Peer. "Escaping Poverty". ^ a b c d Broadberry, Stephen N.; Guan, Hanhui; Li, David D. (2017-04-01). "China, Europe and the Great Divergence: A Study in Historical National Accounting, 980-1850". SSRN 2957511. ^ a b c "China has been poorer than Europe longer than the party thinks". The Economist. 2017-06-15. Retrieved 2017-06-22. ^ a b Broadberry, Stephen; Gupta, Bishnupriya (2006-02-01). "The early modern great divergence: wages, prices and economic development in Europe and Asia, 1500–18001" (PDF). The Economic History Review (Submitted manuscript). 59 (1): 2–31. doi:10.1111/j.1468-0289.2005.00331.x. ISSN 1468-0289. ^ a b Koyama, Mark (2017-06-15). "Jared Rubin: Rulers, religion, and riches: Why the West got rich and the Middle East did not?". Public Choice. 172 (3–4): 549–552. doi:10.1007/s11127-017-0464-6. ISSN 0048-5829. ^ a b c Bassino, Jean-Pascal; Broadberry, Stephen; Fukao, Kyoji; Gupta, Bishnupriya; Takashima, Masanori (2018-12-01). "Japan and the great divergence, 730–1874". Explorations in Economic History. doi:10.1016/j.eeh.2018.11.005. hdl:10086/29758. ISSN 0014-4983. ^ a b c d Pomeranz 2000, pp. 36, 219–225. ^ a b c d e f Hobson 2004, p. 77. ^ a b Paul Bairoch (1995). Economics and World History: Myths and Paradoxes. University of Chicago Press. pp. 101–108. ^ Goldstone, Jack A. (2015-04-26). "The Great and Little Divergence: Where Lies the True Onset of Modern Economic Growth?". Rochester, NY. ^ Jack Goldstone et al. Phases of global demographic transition correlate with phases of the Great Divergence and Great Convergence. Technological Forecasting and Social Change. Volume 95, June 2015, Page 163. ^ a b Frank 2001. ^ Grinin L., Korotayev A., Goldstone J. Great Divergence and Great Convergence. A Global Perspective. Heidelberg – New York – Dordrecht – London: Springer, 2015. ^ Maddison 2001, pp. 51–52. ^ a b c Parthasarathi 2011, pp. 38–45. ^ a b c d Jean Batou (1991). Between Development and Underdevelopment: The Precocious Attempts at Industrialization of the Periphery, 1800-1870. Librairie Droz. pp. 181–196. ISBN 9782600042932. ^ a b c Allen 2009, p. 548. ^ a b c Chen 2012. ^ Pomeranz 2000, p. 219. ^ a b Pomeranz 2000, p. 187. ^ Pomeranz 2000, p. 241. ^ North & Thomas 1973, pp. 11–13. ^ Bolt, Jutta; van Zanden, Jan Luiten (2014-08-01). "The Maddison Project: collaborative research on historical national accounts". The Economic History Review. 67 (3): 627–651. doi:10.1111/1468-0289.12032. ISSN 1468-0289. ^ North & Thomas 1973, pp. 16–18. ^ Pomeranz 2000, pp. 31–69, 187. ^ a b Feuerwerker 1990, p. 227. ^ Elvin 1973, pp. 7, 113–199. ^ Elvin 1973, pp. 204–205. ^ Elvin 1973, pp. 91–92, 203–204. ^ Myers & Wang 2002, pp. 587, 590. ^ Myers & Wang 2002, p. 569. ^ Myers & Wang 2002, p. 579. ^ Parthasarathi 2011, pp. 180–182. ^ Parthasarathi 2011, pp. 59, 128, 138. ^ Parthasarathi 2011, p. 2. ^ Indrajit Ray (2011). Bengal Industries and the British Industrial Revolution (1757-1857). Routledge. pp. 57, 90, 174. ISBN 978-1-136-82552-1. ^ Bagchi, Amiya (1976). Deindustrialization in Gangetic Bihar 1809-1901. New Delhi: People’s Publishing House. ^ Islahi, Abdul Azim. "Book review. The long diverfence: how Islamic law held back the Middle East by Timur Kuran". ^ Donald Quataert (2002). Ottoman Manufacturing in the Age of the Industrial Revolution. Cambridge University Press. ISBN 9780521893015. ^ a b c Zachary Lockman (Fall 1980). "Notes on Egyptian Workers' History". International Labor and Working-Class History (18): 1–12. JSTOR 27671322. ^ a b c d e f Jean Batou (1991). Between Development and Underdevelopment: The Precocious Attempts at Industrialization of the Periphery, 1800-1870. Librairie Droz. pp. 193–196. ISBN 9782600042932. ^ Pomeranz 2000, p. 251. ^ Pomeranz 2000, p. 214. ^ a b "Japan and the Great Divergence, 730-1874 | Oxford Economic and Social History Working Papers | Working Papers". www.economics.ox.ac.uk. Retrieved 2017-05-13. ^ Francks, Penelope (2016). "Japan in the Great Divergence Debate: The Quantitative Story". Japan and the Great Divergence. Palgrave Macmillan, London. pp. 31–38. doi:10.1057/978-1-137-57673-6_4. ISBN 978-1-137-57672-9. ^ a b Pomeranz 2000, p. 37. ^ Kim 2012, p. 137. ^ Kim 2012, pp. 165–168, 229–250. ^ Kim 2012, p. 274. ^ Kim 2012, pp. 270–273. ^ a b c d Dincecco, Mark (October 2017). State Capacity and Economic Development by Mark Dincecco. doi:10.1017/9781108539913. ISBN 9781108539913. ^ Pomeranz 2000, p. 65. ^ Pomeranz 2000, pp. 62–66. ^ Pomeranz 2000, p. 70. ^ a b c Pomeranz 2000, pp. 70–71. ^ Pomeranz 2000, p. 82. ^ Pomeranz 2000, pp. 87, 196. ^ a b Paul Bairoch (1995). Economics and World History: Myths and Paradoxes. University of Chicago Press. pp. 31–32. ^ Easterly, W., & Levine, R. (2003). Tropics, germs, and crops: how endowments influence economic development. Journal of monetary economics, 50(1), 3-39. ^ a b c d e f g h Clark & Feenstra 2003. ^ Landes 2006, p. 5. ^ Lin 1995, p. 276. ^ Pomeranz 2000, p. 49. ^ Allen 2009, pp. 525–526. ^ Pomeranz 2000, p. 36. ^ Pomeranz 2000, p. 39. ^ Pomeranz 2000, p. 107. ^ Pomeranz 2000, pp. 45–48. ^ Pomeranz 2000, p. 46. ^ a b c Fernand Braudel (1982). Civilization and Capitalism, 15th-18th Century. 3. University of California Press. p. 534. ISBN 9780520081161. ^ Parthasarathi 2011, p. 45. ^ a b c Jean Batou (1991). Between Development and Underdevelopment: The Precocious Attempts at Industrialization of the Periphery, 1800-1870. Librairie Droz. p. 189. ISBN 9782600042932. ^ M. Shahid Alam (2016). Poverty From The Wealth of Nations: Integration and Polarization in the Global Economy since 1760. Springer Science+Business Media. p. 33. ISBN 9780333985649. ^ Paul Bairoch (1995). Economics and World History: Myths and Paradoxes. University of Chicago Press. p. 104. ^ Allen, R. C., Bassino, J. P., Ma, D., Moll‐Murata, C., & Van Zanden, J. L. (2011). Wages, prices, and living standards in China, 1738–1925: in comparison with Europe, Japan, and India. The Economic History Review, 64, 8-38. ^ Maddison, A. (2007). The world economy volume 1: A millennial perspective volume 2: Historical statistics. Academic Foundation. 46-50. ^ a b c Broadberry, S., Custodis, J., & Gupta, B. (2015). India and the great divergence: An Anglo-Indian comparison of GDP per capita, 1600–1871. Explorations in Economic History, 55, 58-75. ^ Landes, D. S. (1969). The Unbound Promethous. ^ Allen, R. C. (2011). Global economic history: a very short introduction (Vol. 282). Oxford University Press. 10-11. ^ Whaples, R. (1995). Where is there consensus among American economic historians? The results of a survey on forty propositions. The Journal of Economic History, 55(1), 139-154. ^ a b Roser, Max (2019-01-22). "Life Expectancy". Our World in Data. ^ Paul Bairoch (1995). Economics and World History: Myths and Paradoxes. University of Chicago Press. pp. 88–92. ^ a b c Parthasarathi 2011. ^ a b c Junie T. Tong (2016). Finance and Society in 21st Century China: Chinese Culture Versus Western Markets. CRC Press. p. 151. ISBN 978-1-317-13522-7. ^ a b c John L. Esposito, ed. (2004). The Islamic World: Past and Present. Volume 1: Abba - Hist. Oxford University Press. p. 174. ISBN 978-0-19-516520-3. ^ a b c Indrajit Ray (2011). Bengal Industries and the British Industrial Revolution (1757-1857). Routledge. pp. 7–10. ISBN 978-1-136-82552-1. ^ a b c d e Broadberry & Gupta 2005. ^ Henry Yule, A. C. Burnell (2013). Hobson-Jobson: The Definitive Glossary of British India. Oxford University Press. p. 20. ^ Booker, M. Keith (1997). Colonial Power, Colonial Texts: India in the Modern British Novel. University of Michigan. pp. 153–154. ISBN 9780472107803. ^ T.R. Jain; V.K. Ohri. Statistics for Economics and indian economic development. VK publications. p. 15. ISBN 9788190986496. ^ Jeffrey G. Williamson, David Clingingsmith (August 2005). "India's Deindustrialization in the 18th and 19th Centuries". Harvard University. ^ Twomey, M. J. (1983). Employment in nineteenth century Indian textiles. ^ McAlpin, M. B. (1974). Railroads, Prices, and Peasant Rationality: India 1860–1900. The Journal of Economic History, 34(3), 662-684. ^ Donaldson, D. (2018). Railroads of the Raj: Estimating the impact of transportation infrastructure. American Economic Review, 108(4-5), 899-934. ^ Burgess, R., & Donaldson, D. (2010). Can openness mitigate the effects of weather shocks? Evidence from India's famine era. American Economic Review, 100(2), 449-53. ^ Klein, I. (1984). When the rains failed: famine, relief, and mortality in British India. The Indian Economic & Social History Review, 21(2), 185-214. ^ Grier, R. M. (1999). Colonial legacies and economic growth. Public choice, 98(3-4), 317-335. "The literature on colonialism and underdevelopment is mostly theoretical, anecdotal, and has, for the most part, failed to take advantage of the formal empirical work being done in new growth theory. This essay has tried to close that gap by presenting some empirical tests of oft-debated questions in the literature. I find that the identity of the colonizing power has a significant and permanent effect on subsequent growth and development, which would deny the validity of a crude exploitation hypothesis. Colonies that were held for longer periods of time than other countries tend to perform better, on average, after independence. This finding holds up even when the sample is reduced to British and French Africa." ^ Acemoglu, D., Johnson, S., & Robinson, J. A. (2001). The colonial origins of comparative development: An empirical investigation. American economic review, 91(5), 1369-1401. ^ Easterly, W., & Levine, R. (2016). The European origins of economic development. Journal of Economic Growth, 21(3), 225-257. ^ Feyrer, J., & Sacerdote, B. (2009). Colonialism and modern income: Islands as natural experiments. The Review of Economics and Statistics, 91(2), 245-262. ^ Pomeranz 2000, pp. 114–115. ^ Pomeranz 2000, p. 163. ^ Pomeranz 2000, p. 164. ^ a b North, Douglass C.; Weingast, Barry R. (1989). "Constitutions and Commitment: The Evolution of Institutions Governing Public Choice in Seventeenth-Century England". The Journal of Economic History. 49 (4): 803–832. doi:10.1017/S0022050700009451. JSTOR 2122739. ^ Acemoglu, Daron; Johnson, Simon; Robinson, James (2005). "The Rise of Europe: Atlantic Trade, Institutional Change, and Economic Growth". American Economic Review. 95 (3): 546–579. doi:10.1257/0002828054201305. hdl:1721.1/64034. ISSN 0002-8282. ^ Pomeranz 2000, p. 169. ^ Pomeranz 2000, p. 170. ^ Rosenberg, Nathan (1986). How The West Grew Rich: The Economic Transformation Of The Industrial World. New York Basic Books. ^ Waley-Cohen, Joanna (1993). "China and Western Technology in the Late Eighteenth Century". The American Historical Review. 99 (5): 1525–1544. doi:10.2307/2167065. JSTOR 2167065. ^ Brenner & Isett 2002. ^ Van Bavel, Bas; Buringh, Eltjo; Dijkman, Jessica (2017). "Mills, cranes, and the great divergence: the use of immovable capital goods in western Europe and the Middle East, ninth to sixteenth centuries". The Economic History Review. 71: 31–54. doi:10.1111/ehr.12571. ISSN 1468-0289. ^ Pomeranz 2000, p. 190. ^ Pomeranz 2000, p. 264. ^ Pomeranz 2000, p. 266. ^ See for example, Xu Fuguan 徐復觀, Xueshu yu Zhengzhi zhi jian 學術與政治之間. (Taibei: Taiwan Xuesheng Shuju, 1980), 101–126, 331–395, 497–502. ^ Yu Yingshi 余英時, Zhongguo Jinshi Zongjiao Lunli yu Shangren Jingshen 中國近世宗教倫理與商人精神. (Taibei: Lianjing Chuban Shiye Gongsi, 1987). ^ Billy So, Prosperity, Region, and Institutions in Maritime China. (Cambridge: Harvard University Press, 2000), 253–279. ^ Billy So, “Institutions in market economies of premodern maritime China.” In Billy So ed., The Economy of Lower Yangzi Delta in Late Imperial China. (New York: Routledge, 2013), 208–232. ^ Pomeranz 2000, pp. 212–214. ^ Donald Quataert (2002). Ottoman Manufacturing in the Age of the Industrial Revolution. Cambridge University Press. pp. 7–8. ISBN 9780521893015. ^ Clark, Gregory (2007). A Farewell to Alms. Princeton University Press. pp. 8, 11, 120, 165, 271. ISBN 978-0-691-12135-2. ^ Sng, Tuan-Hwee (2014-10-01). 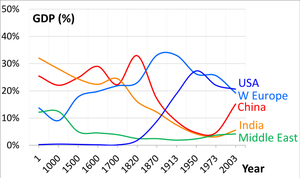 "Size and dynastic decline: The principal-agent problem in late imperial China, 1700–1850". Explorations in Economic History. 54: 107–127. doi:10.1016/j.eeh.2014.05.002. ^ Koyama, Mark; Moriguchi, Chiaki; Sng, Tuan-Hwee (2015-10-28). "Geopolitics and Asia's Little Divergence: A Comparative Analysis of State Building in China and Japan after 1850". SSRN 2682702. ^ Jeffrey G. Williamson (2011). Trade and Poverty: When the Third World Fell Behind. MIT Press. p. 91. ISBN 9780262295185. ^ Cox, Gary W. (2017). "Political Institutions, Economic Liberty, and the Great Divergence". The Journal of Economic History. 77 (3): 724–755. doi:10.1017/S0022050717000729. ISSN 0022-0507. ^ a b Lin, Justin Yifu (1995-01-01). "The Needham Puzzle: Why the Industrial Revolution Did Not Originate in China". Economic Development and Cultural Change. 43 (2): 269–292. doi:10.1086/452150. ISSN 0013-0079. ^ De Long, J. Bradford; Shleifer, Andrei (1993-10-01). "Princes and Merchants: European City Growth before the Industrial Revolution". The Journal of Law and Economics. 36 (2): 671–702. CiteSeerX 10.1.1.164.4092. doi:10.1086/467294. ISSN 0022-2186. ^ Luigi, Pascali (2017). "The Wind of Change: Maritime Technology, Trade, and Economic Development" (PDF). American Economic Review. 0 (9): 2821–2854. doi:10.1257/aer.20140832. ISSN 0002-8282. ^ a b ehs1926 (2017-08-24). "Globalisation and Economic Development: A Lesson from History". The Long Run. Retrieved 2017-08-24. ^ Acemoglu, Daron; Zilibotti, Fabrizio (1997-08-01). "Was Prometheus Unbound by Chance? Risk, Diversification, and Growth". Journal of Political Economy. 105 (4): 709–751. CiteSeerX 10.1.1.680.8598. doi:10.1086/262091. ISSN 0022-3808. ^ Crafts, N. F. R. (1977-08-01). "Industrial Revolution in England and France: Some Thoughts on the Question, "Why was England First?"". The Economic History Review. 30 (3): 429–441. doi:10.1111/j.1468-0289.1977.tb00275.x. ISSN 1468-0289. ^ Mokyr, Joel; Voth, Hans-Joachim (June 2010). "Understanding growth in Europe, 1700–1870: Theory and evidence". Understanding growth in Europe, 1700–1870: theory and evidence (Chapter 1) - The Cambridge Economic History of Modern Europe. p. 10. doi:10.1017/CBO9780511794834.003. ISBN 9780511794834. ^ Pomeranz 2000, pp. 215–219. ^ Pomeranz 2000, pp. 223–225. ^ Pomeranz 2000, pp. 219–225. ^ Pomeranz 2000, pp. 230–238. ^ Pomeranz 2000, pp. 228–219. ^ Pomeranz 2000, pp. 242–243. ^ Parthasarathi 2011, pp. 128, 226–227, 244. ^ Parthasarathi 2011, pp. 252–258. ^ Pomeranz 2000, pp. 257–258. ^ a b de la Croix, David; Doepke, Matthias; Mokyr, Joel (2017). "Clans, Guilds, and Markets: Apprenticeship Institutions and Growth in the Pre-Industrial Economy". The Quarterly Journal of Economics. 133: 1–70. doi:10.1093/qje/qjx026. hdl:2078.1/172953. Scheidel, Walter (2008). "From the 'Great Convergence' to the 'First Great Divergence': Roman and Qin-Han State Formation and its Aftermath": 11–23. doi:10.2139/ssrn.1096433. ISSN 1556-5068. Grinin, Leonid; Korotayev, Andrey (2015). Great Divergence and Great Convergence. A Global Perspective. Springer. ISBN 9783319177793. Kenneth Pomeranz, FBA is University Professor of History at the University of Chicago. He received his B.A. from Cornell University in 1980 and his Ph.D. from Yale University in 1988, where he was a student of Jonathan Spence. He then taught at the University of California, Irvine, for more than 20 years. He was elected a Fellow of the American Academy of Arts & Sciences in 2006. In 2013-14 he was the president of the American Historical Association. The Rise and Fall of the Great Powers: Economic Change and Military Conflict from 1500 to 2000, by Paul Kennedy, first published in 1987, explores the politics and economics of the Great Powers from 1500 to 1980 and the reason for their decline. It then continues by forecasting the positions of China, Japan, the European Economic Community (EEC), the Soviet Union and the United States through the end of the 20th century. The Austro-Hungarian economy changed dramatically during the existence of the Dual Monarchy. The capitalist way of production spread throughout the Empire during its 50-year existence replacing medieval institutions. Technological change accelerated industrialization and urbanization. The GNP per capita grew roughly 1.76% per year from 1870–1913. That level of growth compared very favorably to that of other European nations such as Britain (1%), France (1.06%), and Germany (1.51%). However, in a comparison with Germany and Britain: the Austro-Hungarian economy as a whole still lagged considerably, as sustained modernization had begun much later. In 1873, the old capital Buda and Óbuda were officially merged with the third city, Pest, thus creating the new metropolis of Budapest. The dynamic Pest grew into Hungary's administrative, political, economic, trade and cultural hub. The Industrial Revolution involved a shift in the United States from manual labor-based industry to more technical and machine-based manufacturing which greatly increased the overall production and economic growth of the United States, signifying a shift from an agrarian to an industrial economy widely accepted to have been a result of Samuel Slater's introduction of British Industrial methods in textile manufacturing to the United States, and necessitated by the War of 1812.